The Greenleaf Hut with Mount Lafayette in the background. Photo by Phil Brown. On July 15, 1932, two giants of conservation met on top of Mount Marcy: Bob Marshall and Paul Schaefer. Marshall was partway through a marathon hike that would take him to the summits of thirteen High Peaks. Schaefer was taking photos to be used in a campaign against a proposal to allow cabins in the Forest Preserve. Schaefer’s account of the chance meeting appears in an appendix to my book Bob Marshall in the Adirondacks, an anthology of Marshall’s Adirondack writings. When informed of the cabin proposal and various assaults on the Forest Preserve, Marshall became agitated and paced back and forth on the summit of the state’s highest mountain. “We simply must band together—all of us who love the wilderness. We must fight together—wherever and whenever wilderness is attacked,” Marshall declared to Schaefer. A few years later, Marshall founded the Wilderness Society with some like-minded colleagues. I thought of this encounter after my girlfriend Carol and I hiked Franconia Ridge in the White Mountains in late August. As I mentioned in an earlier post, this is one of the most spectacular hikes in the Northeast. 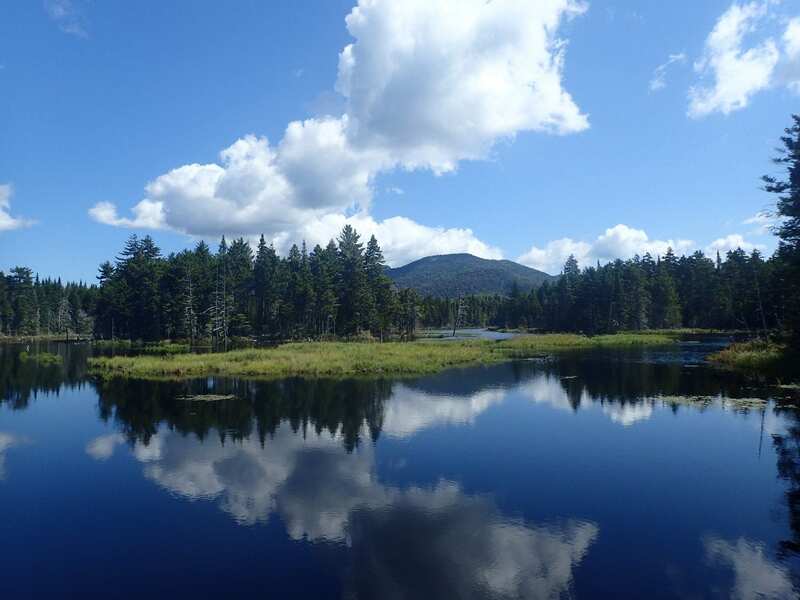 Of course, we have spectacular hikes in the Adirondacks too, but our New Hampshire outing had something our Adirondack hikes lack: a cabin. 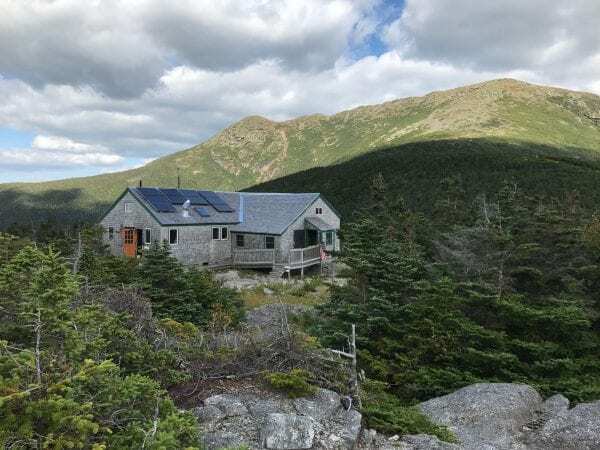 Toward the end of our nine-mile day, we stopped at the Greenleaf Hut, which the Appalachian Mountain Club maintains on the shoulder of Mount Lafayette. Other hikers were spending the night, but we just wanted to relax. We bought iced teas and a magic bar and sat at one of the dining tables before resuming our descent to Franconia Notch. Greenleaf is one of eight high-elevation huts located along the Appalachian Trail in the White Mountains. The largest and highest, at 5,030 feet, is the Lakes of the Clouds hut on Mount Washington. It can accommodate ninety-six people. There is a long tradition of huts in the Whites. The hut at Lonesome Lake, for example, started out as a fishing camp in 1876. It has been part of the AMC hut system since 1929. The huts are extremely popular. On our Franconia Ridge hike, Carol and I met a woman on Little Haystack who was spending several days trekking from one hut to another—a not unusual adventure in the Whites. The Adirondacks has no such tradition. Article 14 of the state constitution mandates that the public Forest Preserve “shall be forever kept as wild forest lands.” Over the decades, however, there have been at least eight proposals to allow the construction of cabins in the Preserve. The first was in the 1932, the year Schaefer and Marshall met (for the first time) on Mount Marcy. That year, Robert Moses, the influential director of the New York State Council of Parks, supported a constitutional amendment that would have let the state construct cabins anywhere in the Preserve with the approval of the state legislature. Thanks to efforts by Schaefer and other conservationists, the voters defeated the measure by a 2-1 ratio. In later years, seven similar proposals were introduced to the state legislature, but none advanced so far as to be put to a public vote, according to Eleanor Brown’s useful book The Forest Preserve of New York State: A Handbook for Conservationists. The last attempt was a bill in 1962 that would have divided the Preserve into three zones, with 60 percent set aside for habitat management, 30 percent to remain undisturbed, and 10 percent for intensive recreational development, including cabins. Jack Drury of Leading E.D.G.E. is now finishing a study for the state that will identify dozens of potential “hut to hut” routes in the Adirondacks. Unlike those in the Whites, however, virtually all of these “huts” will be on private land—existing motels, B&B’s, lodges, campgrounds, etc. In some cases, Drury may suggest building temporary shelters, such as yurts or platform tents, on timberlands where the state holds an easement. One exception is the Boreas Ponds. As previously reported, the state is looking at establishing temporary lodging on the dirt road leading to the ponds. No formal proposal has been released and details are somewhat sketchy, but the Park’s environmental groups are adamantly opposed. 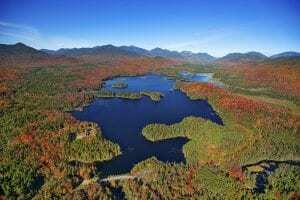 The issue has held up the classification of the Boreas Ponds Tract for months (once again, it’s not on this week’s agenda of the Adirondack Park Agency). I have no idea whether temporary lodging at Boreas Ponds would be popular with the public. I do know that huts in the Whites, in Europe, and elsewhere are well used. Last year in the Italian Dolomites, Carol and I hiked to a refugio at a mountain lake, ordered a sandwich and drink, and enjoyed the scenery while lolling on a sunny bench. That was pretty cool. But it’s not the Adirondack way. I wouldn’t want to see a snack bar at Lake Tear of the Clouds. If we had huts in the Preserve, though, I imagine they’d be a hit with hikers. Just look at the popularity of Johns Brook Lodge, located on an inholding in the High Peaks Wilderness, and Adirondak Loj, located on the edge of the Wilderness Area. One wonders if we have not seen the last of closed-cabin amendments. If just are not the “Adirondack Way” (and by whose definition, anyhow?) then what the heck do you call Adirondak Loj, and particularly Johns Brook Lodge? Excuse my Amazon Fire tablet’s superior AI. It was sure that I meant “just” when I typed “huts”. They took no time to tear down the lodge that Finch Pruyn had right on the Boreas Ponds. That was dumb. They should have sold those one or two acres and the lodge to the ADK and closed down the road. Now they want to rebuild something and leave the road open? Those huts you refer to are on private land! Not the forest preserve! protect it, even in the face of increasing demand for sheltered access. 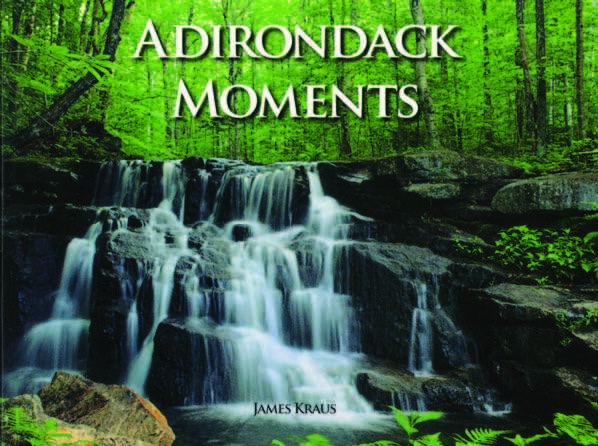 The mixture of private land, wild forest, and wilderness in the Adirondacks is unique. There are many options available for hut-to-hut systems that would use private land only for facility structures. This is what energy should be devoted to for exploring possibilities. Thank you Phil Brown for your article. The ‘Hut system’ is part of what makes the White Mountains unique. The lack of Huts is part of what makes the Adirondacks unique. Let’s keep it that way. I agree that wilderness is precious and rare. It is important to remember that once we start chopping it up, it will be difficult if not impossible to reclaim it. Wilderness in the Forest Preserve is a not only a state treasure, it is a national treasure. Amen to what Blaikie and Gary write. Bob Marshall, Paul Schaefer, Clarence Petty, Barbara McMartin, Anne LaBastille, Liz Thorndike, Peter Paine, John Collins, the list is long of those who understood and act on that understanding of what the park and forest preserve are all about. There are so many opportunities today and in the future for revenue-based glamorous camping on private land, including the private lands protected by conservation easement. From atop Mt. Lafayette this summer the Greenleaf lodge just did not look like it belonged there. Reminded me of a white vinyl McMansion I often see marring the solid green of a scenic mountain. Let’s keep hiker accommodations close to parking areas and in the lowlands.